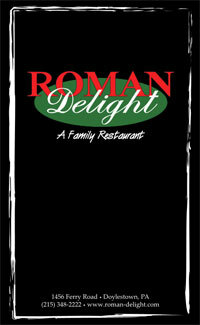 At Roman Delight we use only the freshest ingredients when we prepare any of our menu items. Everything is prepared special when it is ordered – No onions? Light on the cheese? Chicken instead of veal? You got it- we love to accommodate any special requests. We also have a new gluten free menu. 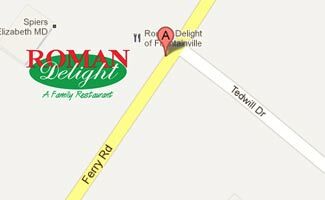 Roman Delight of Fountainville offers such variety of selections that no matter what you’re in the mood for, from hot wings to hoagies, salads to seafood, chicken to clubs, or pizza to pasta we have it all! In addition to our extensive menu, we also have a full bar. Complement your meal with a beer, glass of wine, martini, mixed drink or any one of our specialty drinks! With 6 beers on tap and an ever expanding selection of bottled beers available, we have over 20 different beers! All of our house wines come by the glass or carafe. And don’t forget about our liquor for your favorite cocktail or after dinner drink! Be sure to ask about our daily blackboard specials and to save room for dessert. Don’t forget our entire menu is available for takeout or catering!